I have grown so skinny these past months at the end of Winter – chasing stories around Spitalfields – that I decided to undertake a tour of my favourite Pie & Mash Shops in the company of Spitalfields Life contributing photographer Sarah Ainslie, in order to explore all the delights on offer and put some meat on my bones into the bargain. Pie & Mash Shops have a special place in my affections because they are unique to East London and inextricably bound up with the cultural and historical identity of this place – becoming destinations where people enjoy pilgrimages to seek sustenance for body and soul, by paying homage to the spirit of the old East End incarnated in these tiled, steamy temples dedicated to the worship of hot pies. Let me admit, it is a creed I can subscribe to wholeheartedly. Taking our cue from that golden orb in the sky, Sarah & I decided to commence in the East and work our way West across the territory, beginning with G. Kelly, established since 1937 at 526 Roman Rd. Here we had the privilege to be welcomed by the lovely Sue Venning – resplendent in her white uniform – the proprietor who greets everyone universally with a brisk yet cheery “Yes, Love?” – commonly reciprocated by “Hello, Gorgeous.” It was a delight to walk into this sympathetic, clean and bright interior, adorned with daffodils and lined with marble and tiles, gleaming under the globe lamps. 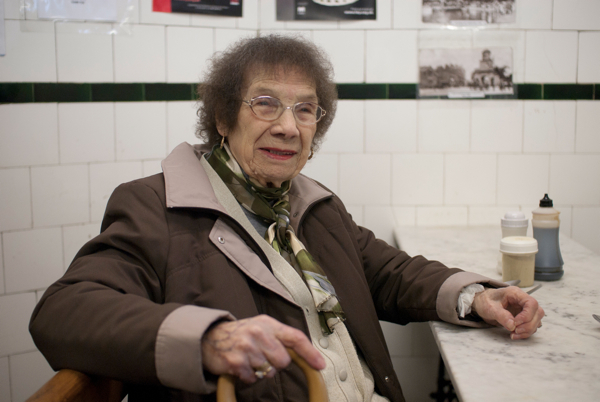 “My Aunt Theresa on my father’s side married George Kelly who opened this in 1937,” explained Sue, introducing the intricate web of relations that connect this establishment to the two other Pie & Mash Shops by the name of Kelly, all independently run today by increasingly distant relatives as the generations pass by. “Samuel Robert Kelly opened up originally in Bethnal Green in 1915 – he had three sons, Samuel who took over in Bethnal Green, Joe who opened in Bonner St and George who came here to the Roman Rd. My father Bill (George Kelly’s brother-in-law) ran this with my mother Bea, until he died in 1969, and then I took over from her in 1990.” she outlined with a relaxed smile and a practised efficiency that left me reeling. 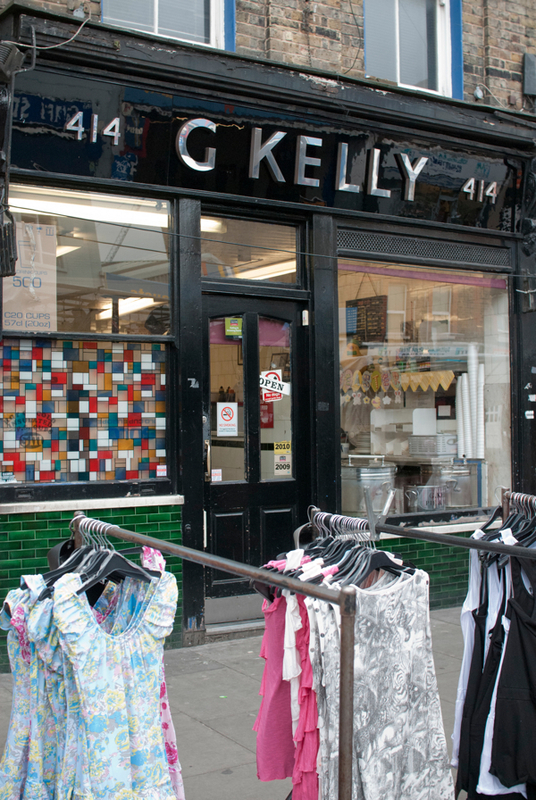 We hit the rush at G. Kelly, 414 Bethnal Green Rd, (connected only genealogically to G. Kelly, Roman Rd) where Matt Kelly, proprietor for the last fifteen years, baker and third generation pie man, had his work cut out in the kitchen to meet the lunchtime demand for pie and mash and liquor at £2.65. Diners here eat off elegant cast iron tables beneath framed portraits of local boxing heroes of yesteryear and everyone is at home in one of this neighbourhood’s cosiest destinations. Up at F.Cooke in Broadway Market, once we had emptied our plates of some outstandingly delicious pies, Sarah & I enjoyed a quiet after-lunch cup of tea with the genial Robert Cooke - “Cooke by name cook by nature” – whose great-grandfather Robert Cooke opened a Pie & Mash Shop at the corner of Brick Lane and Sclater St in 1862. “My father taught me how to make pies and his father taught him. 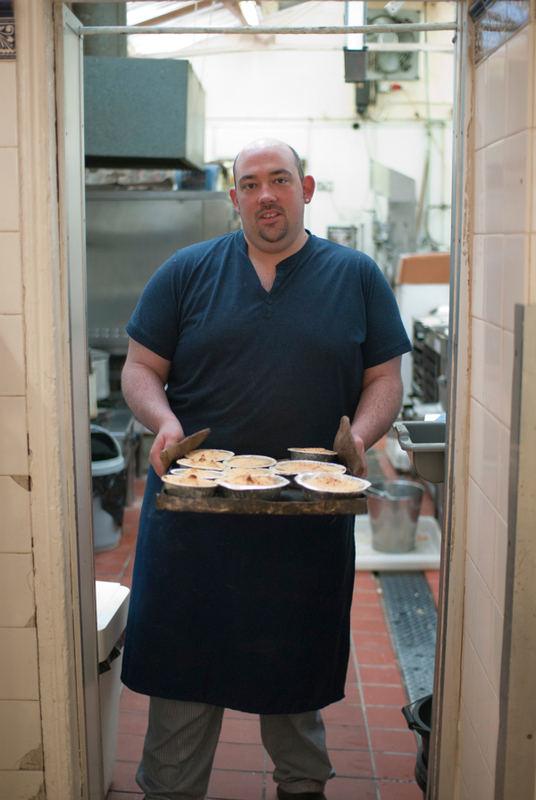 We haven’t changed the ingredients and they are made fresh every day,” explained Robert plainly, a fourth generation born-piemaker sitting proudly in his immaculately preserved cafe, that offers the rare chance to savour the food of more than century ago. 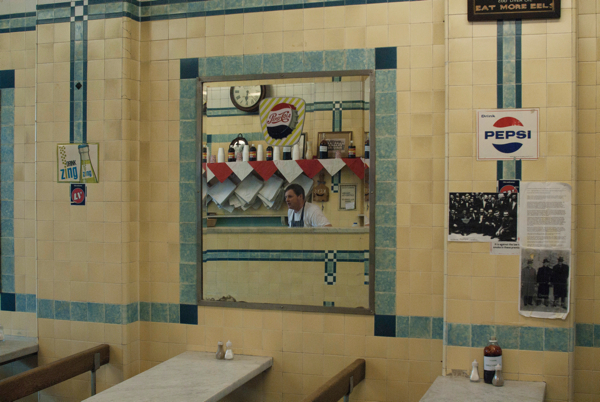 It was a tale as satisfying in its completeness as eating a pie, emphasising how this particular cuisine and these glorious shops are interwoven with the family histories of those who have run them and eaten at them for generations. 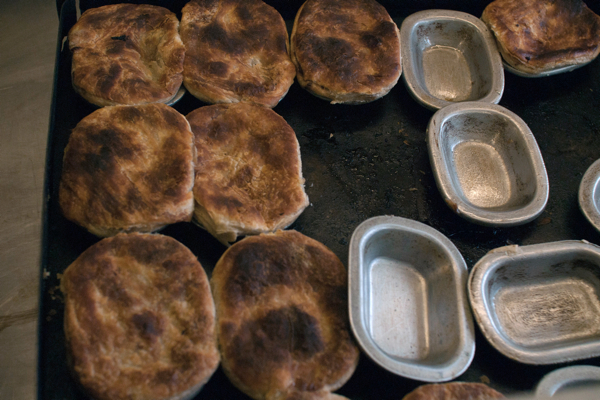 Yet beyond the rich poetry of its cultural origin, this is good-value wholesome food for everyone, freshly cooked without additives, and meat pies, vegetable pies, fruit pies and jellied eels comprise a menu to suit all tastes. Reluctantly, after three Pie & Mash Shops in one day, Sarah & I were finished – but even as we succumbed to the somnolence induced by our intake of pies, we took consolation in dreamy thoughts of all those pleasures that await us in the other Pie & Mash Shops of the East End, yet to come. 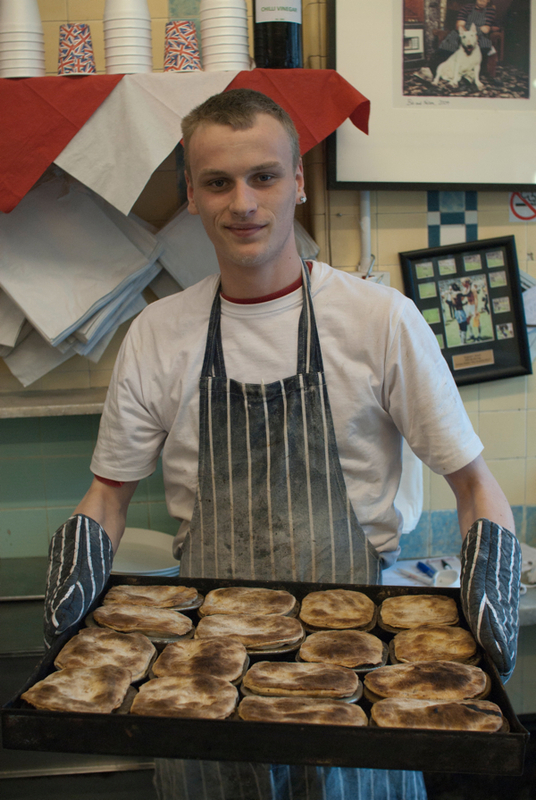 This is Dean Cecil who bakes the pies at G.Kelly in the Roman Rd. Sue Venning at G.Kelly, Roman Rd – her Aunt Theresa, who married George Kelly, is the woman in the dark coat, pictured in the black and white photo, standing outside the shop in 1937. 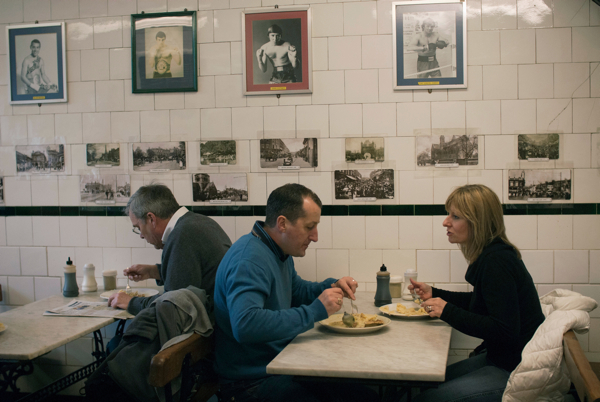 The prizefighters of yesteryear fondly remembered in the Pie & Mash Shop in Bethnal Green. 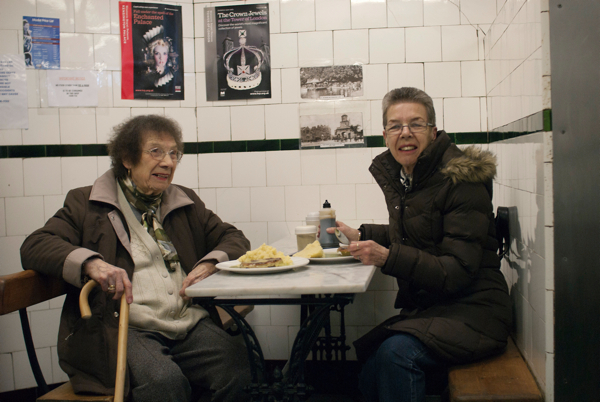 Regulars, Julia Richards and her sprightly daughter Patricia Wootton aged seventy, at the favoured corner table at G.Kelly, Bethnal Green. Robert Cooke under the clock commissioned by his grandfather Robert Cooke from a clockmaker in Hackney in 1911. F.Cooke, 9 Broadway Market, since 1900.
what? what? you put the parsley sauce ON the pie? **rushes off to consult grigson, English Food, and white, Good Things in England. A lovely trip down memory lane for me…Thank You! And now my tongue is hanging out for Pie n Mash…lol! But definitely not on the menu tonight, in the middle of the Swedish forest. Awwwww Pie n Mash, best food ever! On my next visit to the UK, I will have to make a stop at one of these shops. Pies look divine and the jellied eels look very interesting, will have to sample some. I’m sat here drooling, and seriously thinking about making the 400 mile round trip for 2 and 2 with licquor. Hurrah for this – I’m a huge pie and mash fan. 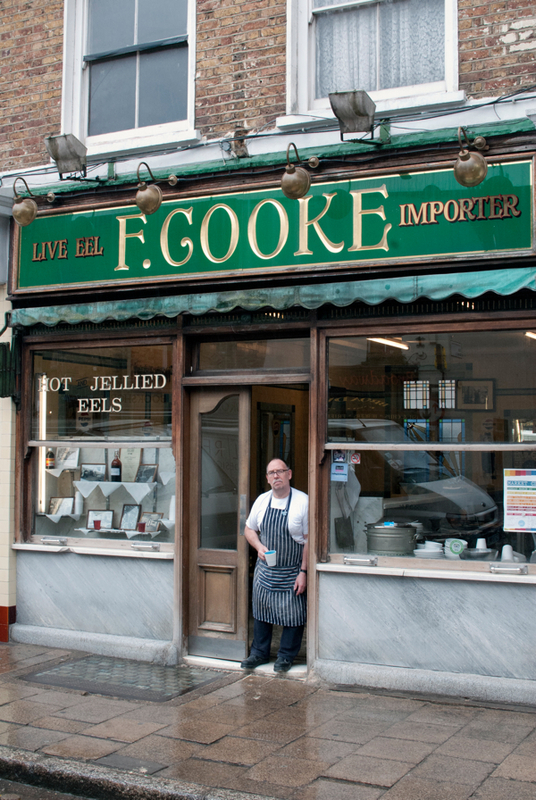 Raised on it at Cooke’s Kingsland shop, where, as Julia says – you could watch eels being chopped into wriggling bits in the left window. A great spectator sport for an 10 year old boy. Of all the outlets featured Cooke’s in Broadway Market is my favourite. 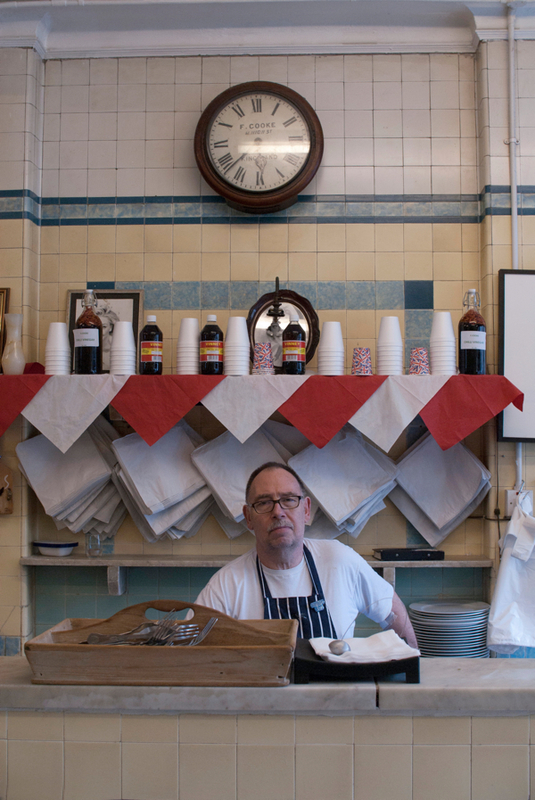 I know it’s off your patch, but I tried Cooke’s of Hoxton on Tuesday – the owner looks just like Robert Cooke..
PS watch out for me in Pellici’s this Friday lunchtime if you’re about..
Our local was in Watney Market – I’m sure Sandra Esqulant would be very familiar with it. Pie and mash and the all important liquor was a regular treat in our house – I can still ‘taste’ the very particular consistency of the wet pastry. Wouldn’t dare try it now though for fear of disappointment. 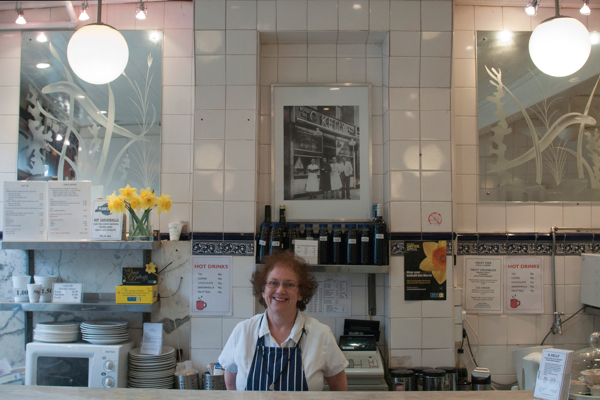 One of the few remaining pie and mashes here in Newham – Robin’s in East Ham – has just closed due to falling demand. It’ll probably go over to the fried chicken so loved by local school children. None of your many posts have made me more homesick or more hungry, maybe I should open a P&M in the Middle East…..
And don’t forget south of the river, not just the East End! Manzes, Tower Bridge Road and Peckham; Cooke’s in the Cut, Waterloo (now gone); Goddards in Greenwich (the oldest established P&M in London). I’m salivating…..
It’s a bit tougher if you’re veggie, but I still enjoy my double mash and liquor, at Cooke’s on the Goldhawk Road. Lovely. Along with Robin’s in East Ham, Peter’s Pie & Mash Shop in Watney Street near Shadwell station has recently closed. Shame we can’t make them heritage sites or something. Support your local pie and mash shop! There is also a Robin’s Pie and Mash shop in Romford, divine. 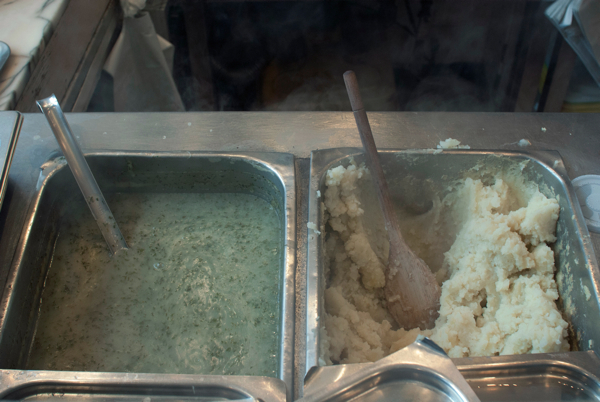 i love jellied eels but i have a morbid fear of both the mash in pie and mash shops…and of course the liquor. much as i admire the metrosexualist, david beckham, who is said to fed ex pie, mash and liquor to LA on a regular basis, and even though roy orbison loved britain as much for the P, M & L as our early appreciation of his falsetto tones, i can’t go there. it’s funny tho because even here in west london, all the pie and mash shops are called Cooks (with or without an E). What’s all that about. I just nominated Spitalfields Life as best blog in the Observer Foods Awards. Maybe you should too. As a young apprentice carpenter working just off the Burdet Road, Every lunchtime was at Charlies Pie n Mash without fail, Long since gone, I am now 78yrs,and still remember it. 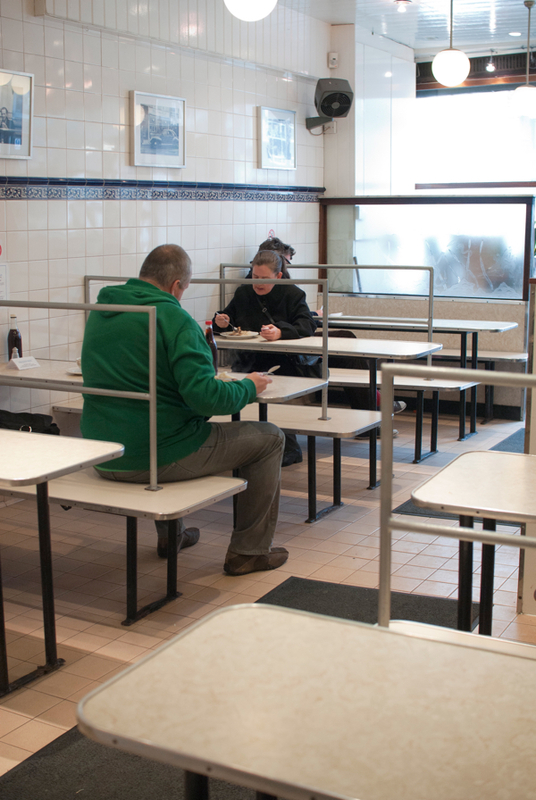 Love pie and mash, but why do these shops always make use of marble-topped counters and tables? Added to the usual lukewarm meal, (and likely an open door), your grub is always cold! Brings back memories of childhood holidays at Nan and Grandads – walk over the bridge to 414 Roman Road or down the Roman to the other one. The pie and mash shop was a must. just wondering if the family that run cookes pie and mash shops could be long lost relatives of mine as my maiden name was cooke. Many’s the time I’ve spent in or around Brick Lane over the years, either with mates in Dalston, Business in Whitechapel, Deals in the Mile End Rd, Pints in the Rodney Head or the one round from the old brewery, and finally above a curry house where my buddy lays his weary bones at night… I’ve had many a curry in a hurry, many a rabbit out of habit, but the one thing that still makes me squeal, is a pie some mash and a Jellied Eel… now I live on the South Coast but next time it won’t be the Bagel shop I want the most, I’ll be heading to G. Kelly to pamper my belly. Thanks for your fantastic blog – I’ll be back for more, for sure, now I’m out the door…. I was born and grew up in east london and must say traditional pie mash and liquor is the food of the gods. my first words i spoke beleive it or not, was pie and mash and i said it to my mum while sitting on the counter of the pie and mash shop in Woolwich SE London when i was only knee high. I emigrated to australia some 18 years ago and still long for this wonderful dish, and seeing photos here on this site has me drowling like a dog after a bone. alas no such thing here as pie and mash, nothing even close. so every one over there eating this superb food enjoy and savor every bite you dont know how lucky you are. after enjoying pie and mash since the 50s in the east end, i moved away to essex and had to travel to romford to robins pie and mash shop. i am delighted to say that robins have opened in southend-on-sea. right in the middle of town.after reading about the many pie and mash shops i have to mention harris’s in roman road near bonner street. now gone. it was run by mrs harris and was a big favourite in the area. 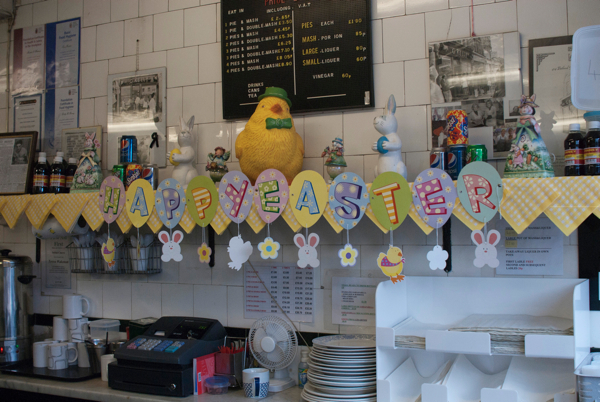 Also a big lover of p and m. As a child used the one in West Ham Lane (Lediard’s) now some sort of chicken joint. Saturday morning pictures, 6d and then up to the Pie & Mash 7d. Luvverly. 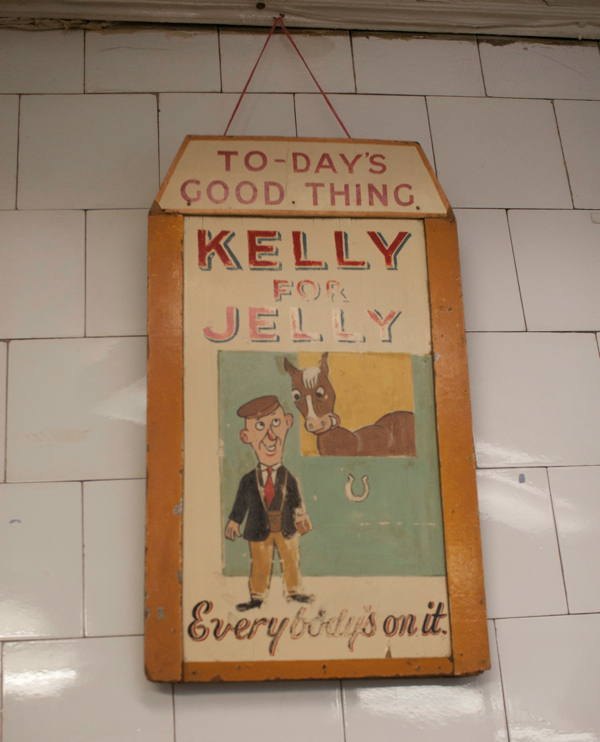 Been to both Kellys in Roman Road (market), one in Cambridge Heath Road, one in Bethnal Green Road, Manzies in Chapel Street Market and Goddards in Greenwich, plus the one in Tower Bridge Road also one in Green Street (Duncan’s? ), before the match at West Ham (sadly closed down but lovely p & m), didn’t like the one round the corner in the Barking Road. So having given quite a few shops a visit, none taste like my childhood Lediards. Y0u can also get frozen p & m from Sainsbury (Cooke) – not bad but you don’t get the atmosphere of these lovely old shops. Left several off but I am sure they will get a mention. 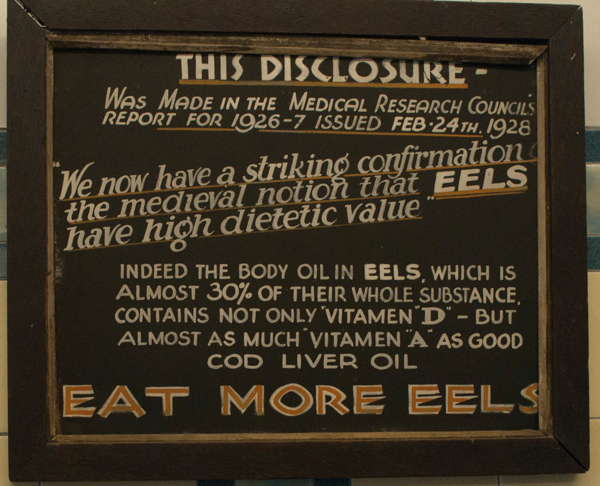 Long live Pie and Mash, and good old eels. 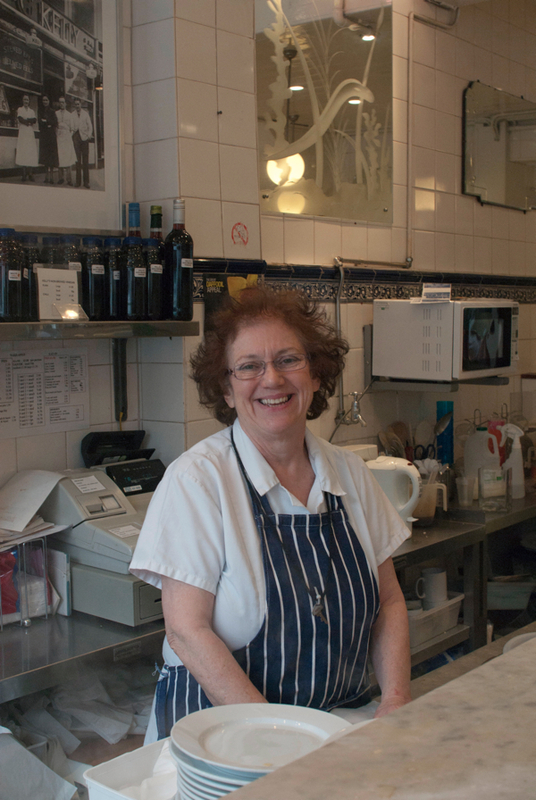 As Norma I used Lediards in West Ham Lane, living just down the road with my brothers and sisters,in family Florist shop, and loved the pie and mash, the best ever. But recently had pie and mash at Franks Pie and Mash, Canvey Island, Essex where i now live and it was the best pie and mash i’ve had for years,99.9% as good as Lediards,(the point one left off as no sawdust on floor, ha ha) highly recomended. Stewed and Jellied eels and afters as well. Hi, great read! Took me back to going to ‘Berts’ on the Old Kent Road with the old man. Lovely memories, and the food of Kings. Anybody remember the Pie and Mash shop in Hackney Road,next too the mens Tailors shop Temples, nearly faceing the Childrens Hostpital, got my first taste of them their in the 1950s? 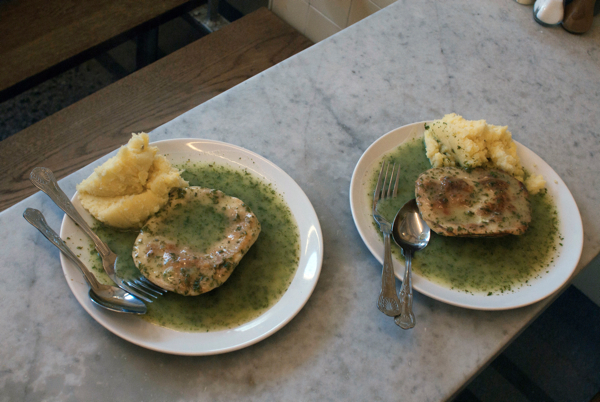 I tasted the Pie, mash and eel and it was too awesome. 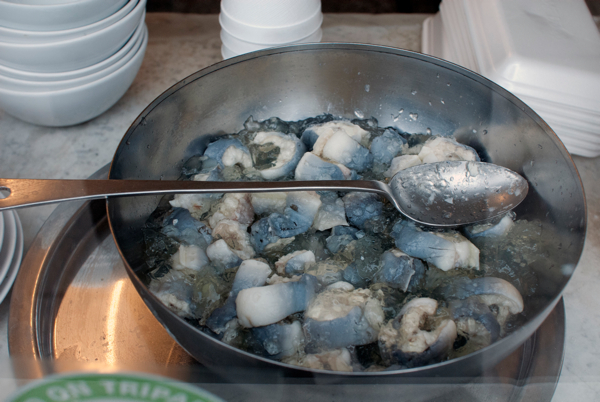 The taste of stewed and/or jellied eels was equally delectable to my tongue. Wanted to have more, but was haunted by the over bursting tummy. Will be there next time soon! I was brought up in Highbury and Stoke Newington as a kid. My regular pie shop was Manze’s in Chapel Market at the Angel. 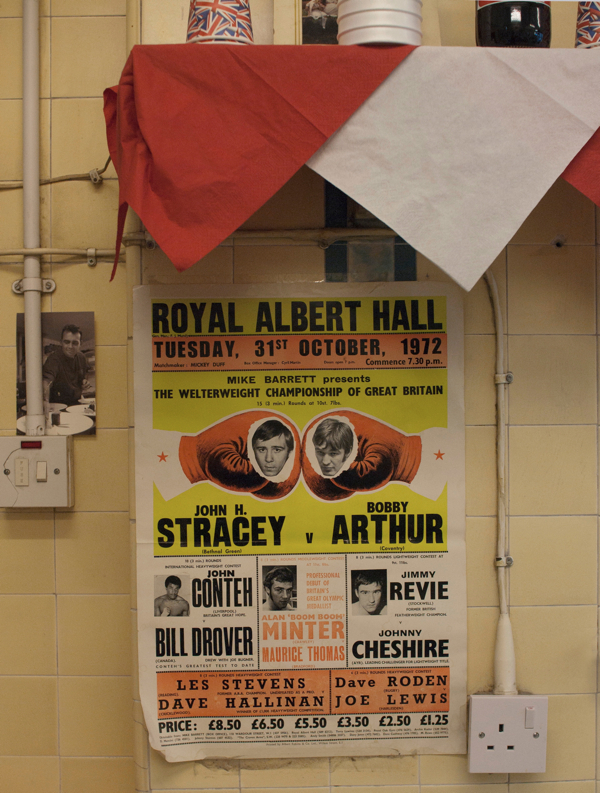 I also used to go to Cookes in Dalston where I remember seeing Arthur Mullard quite often. Another one I visit whenever I get the chance is Manze’s on Tower Bridge Road, but whenever I use public transport to get to the Arsenal, I always return to Manze’s in Chapel Market. Death row? Last meal? Double Pie, Mash and Liquor please! To Ian Silverton I remember the pie shop in Hackney rd next to the tailors, got to admit it wasn’t one I liked. I was brought up on Pie and mash from Fortunes in Hoxton, and cookes in Kingsland rd and Broadway market, also with the odd visit to Kelly’s in Bethnal Green and the Roman. We have one that has opened in Wanstead (Robins), that has recreated the look of the old fashioned Pie shop and it is quite good and has become my regular pie shop. 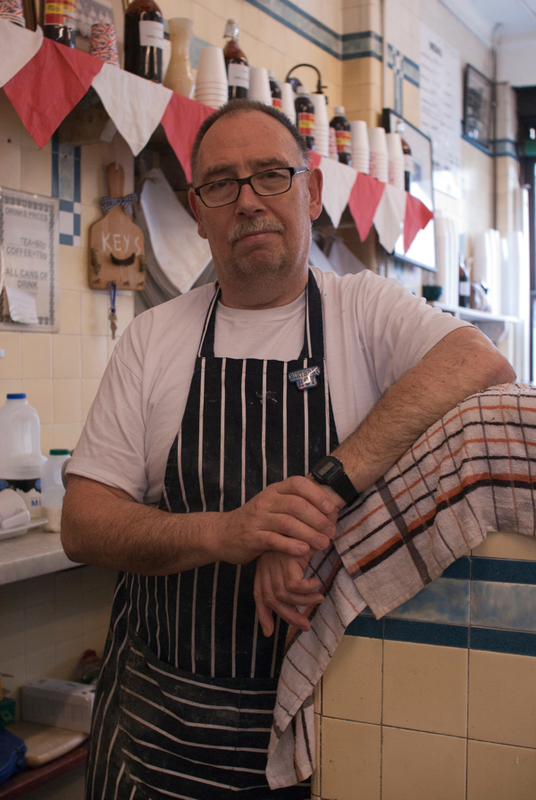 Stephen Jackson,used Robins Pie Shop when stayed in Wanstead, always sat outside,summer or winter, bit cramped inside, very friendly ladies work there,or did when I used it. I was born in late 1947 and until about 1954/5 lived on the Pembury Estate, Dalston (?) At the tender age of about 5/6 I went with friends to Saturday morning pictures and on to a pie and mash shop but have no idea where. Unimaginable that children today would be given such freedom. I last ate pie and mash and jellied eels at a shop in Greenwich, not far from the Cutty Sark. I am making a literary journey of England’s history and culture. As an American, the concept of eating jellied eels is strange indeed. I had smoked eel and at an Eastern European market in Sarasota, Florida so I would not “knock it til I tried it”. Life has some unexpected delicious surprises for the adventurous traveller.